Isolate Protein & Peptide Blend (Whey Peptides, Whey Protein Isolate, Whey Protein Isolate 97%), Whey Protein Concentrate, Maltodextrin, Natural And Artificial Flavors, Chocolate Cookie Crumbs (Rice Flour, Sugar, Tapioca Starch, Palm Oil, Cocoa [Processed With Alkali], Corn Starch, Salt, Chocolate Liquor, Natural Flavors, Sodium Bicarbonate, Soy Lecithin), Gum Blend (Cellulose Gum, Xanthan Gum, Carrageenan), Soy or Sunflower Lecithin, Enzyplex (Papain, Amylase), Silicon Dioxide, Salt, Sucralose, Acesulfame-Potassium. Isolate Protein & Peptide Blend (Whey Peptides, Whey Protein Isolate, Whey Protein Isolate 97%), Whey Protein Concentrate, Cocoa (Processed With Alkali), Natural And Artificial Flavors, Chocolate Cookie Crumbs (Rice Flour, Sugar, Tapioca Starch, Palm Oil, Cocoa (Processed With Alkali), Corn Starch, Salt, Chocolate Liquor, Natural Flavors, Sodium Bicarbonate, Soy Lecithin), Calcium Carbonate, Soy or Sunflower Lecithin, Gum Blend (Cellulose Gum, Xanthan Gum, Carrageenan), Enzyplex (Papain, Amylase), Salt, Sucralose, Acesulfame-Potassium. Isolate Protein & Peptide Blend (Whey Protein Isolate, Whey Peptides, Whey Protein Isolate 97%), Whey Protein Concentrate, Cocoa (Processed With Alkali), Chocolate Cookie Crumbs (Rice Flour, Sugar, Cocoa (Processed With Alkali), Tapioca Starch, Palm Oil, Corn Starch, Natural Flavors, Salt, Sodium Bicarbonate, Soy Lecithin), Natural And Artificial Flavors, Soy or Sunflower Lecithin, Gum Blend (Cellulose, Xanthan, Carrageenan), Enzyplex (Papain, Amylase), Salt, Silicon Dioxide, Sucralose, Acesulfame-Potassium. Isolate Protein & Peptide Blend (Whey Peptides, Whey Protein Isolate, Whey Protein Isolate 97%), Whey Protein Concentrate, Marshmallow Pieces (Sugar, Modified Corn Starch, Corn Syrup, Dextrose, Gelatin, Sodium Hexametaphosphate, Color [FD&C Red No. 40, FD&C Yellow No. 6, FD&C Blue No. 1, FD&C Yellow No. 5], Natural and Artificial Flavors), Natural And Artificial Flavors, Soy or Sunflower Lecithin, Salt, Gum Blend (Cellulose, Xanthan, Carrageenan), Enzyplex (Papain, Amylase), Sucralose, Acesulfame-Potassium. Isolate Protein & Peptide Blend (Whey Protein Isolate, Whey Peptides, Whey Protein Isolate 97%), Whey Protein Concentrate, Cocoa (Processed With Alkali), Natural And Artificial Flavors, Soy or Sunflower Lecithin, Gum Blend (Cellulose, Xanthan, Carrageenan), Enzyplex (Papain, Amylase), Salt, Sucralose, Acesulfame-Potassium. Isolate Protein & Peptide Blend (Whey Peptides, Whey Protein Isolate, Whey Protein Isolate 97%), Whey Protein Concentrate, Natural And Artificial Flavors, Maltodextrin, Calcium Carbonate, Gum Blend (Cellulose Gum, Xanthan Gum, Carrageenan), Soy or Sunflower Lecithin, Enzyplex (Papain, Amylase), Salt, Sucralose, Acesulfame-Potassium. Isolate Protein & Peptide Blend (Whey Peptides, Whey Protein Isolate, Whey Protein Isolate 97%), Whey Protein Concentrate, Natural And Artificial Flavors, Gum Blend (Cellulose Gum, Xanthan Gum, Carrageenan), Soy or Sunflower Lecithin, Beet Juice (Color), Salt, Enzyplex (Papain, Amylase), Calcium Carbonate, Sucralose, Citric Acid, Malic Acid, Acesulfame-Potassium. Isolate Protein & Peptide Blend (Whey Peptides, Whey Protein Isolate, Whey Protein Isolate 97%), Whey Protein Concentrate, Maltodextrin, Calcium Carbonate, Natural And Artificial Flavors, Soy or Sunflower Lecithin, Gum Blend (Cellulose Gum, Xanthan Gum, Carrageenan), Enzyplex (Papain, Amylase), Salt, Sucralose, Acesulfame-Potassium. Whey Protein Isolate and Amino Acid Matrix (Supplying Whey Protein Isolate, Hydrolyzed Whey Protein Isolate, L-Valine, L-Leucine, L-Isoleucine, L-Glutamine), Whey Protein Concentrate [Ultra-Filtered], Cocoa Powder (Processed with Alkali), Natural And Artificial Flavors, Salt, Gum Blend (Cellulose Gum, Xanthan Gum, Carrageenan), Soy Lecithin, Sucralose, Acesulfame Potassium. Isolate Protein & Peptide Blend (Whey Peptides, Whey Protein Isolate, Whey Protein Isolate 97%), Whey Protein Concentrate, Maltodextrin, Calcium Carbonate, Natural And Artificial Flavor, Gum Blend (Cellulose Gum, Xanthan Gum, Carrageenan), Soy or Sunflower Lecithin, Enzyplex (Papain, Amylase), Salt, Beta-Carotene (Color), Sucralose, Acesulfame-Potassium. Isolate Protein & Peptide Blend (Whey Peptides, Whey Protein Isolate, Whey Protein Isolate 97%), Whey Protein Concentrate, Cocoa (Processed With Alkali), Natural And Artificial Flavors, Chocolate Cookie Crumbs (Rice Flour, Sugar, Tapioca Starch, Palm Oil, Cocoa (Processed With Alkali), Corn Starch, Salt, Chocolate Liquor, Natural Flavors, Sodium Bicarbonate, Soy Lecithin), Gum Blend (Cellulose Gum, Xanthan Gum, Carrageenan), Calcium Carbonate, Soy or Sunflower Lecithin, Enzyplex (Papain, Amylase), Sucralose, Acesulfame-Potassium. Isolate Protein & Peptide Blend (Whey Peptides, Whey Protein Isolate, Whey Protein Isolate 97%), Whey Protein Concentrate, Cocoa (Processed With Alkali), Natural Flavors, Salt, Soy or Sunflower Lecithin, Gum Blend (Cellulose Gum, Xanthan, Carrageenan), Enzymatically Modified Steviol Glycosides, Enzyplex (Papain, Amylase), High-Purity Steviol Glycosides (Stevia Extract), Monk Fruit Extract (as Siraitia grosvenorii). Isolate Protein & Peptide Blend (Whey Peptides, Whey Protein Isolate, Whey Protein Isolate 97%), Whey Protein Concentrate, Natural Flavor, Soy or Sunflower Lecithin, Gum Blend (Cellulose Gum, Xanthan, Carrageenan), Salt, Enzymatically Modified Steviol Glycosides, Enzyplex (Papain, Amylase), High-Purity Steviol Glycosides (Stevia Extract), Monk Fruit Extract (as Siraitia grosvenorii). How is Nitro-Tech better than regular whey protein supplements? What else makes Nitro-Tech so great? 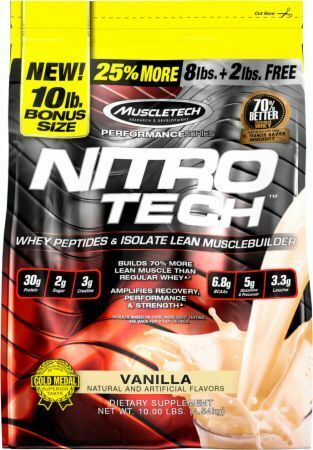 A single scoop of Nitro-Tech contains 30 grams of protein, primarily from whey protein isolate. It also contains ultra-filtered whey protein concentrate and hydrolyzed whey protein isolate, with no more than 1 gram of carbs and 1.5 grams of fat! Most protein powders deliver significantly less protein per scoop, while some protein formulas are loaded with fat and carbs. A remarkable technology driving the purity of the whey protein in Nitro-Tech is its Multi-Phase Filtration Technology. Through multiple phases, this technology is designed to enhance the purity of the whey protein in Nitro-Tech by reducing fat, lactose and impurities. Nitro-Tech contains the key free-form amino acids alanine, glycine and taurine and is designed to deliver essential amino acids and proteinogenic (protein building) amino acids that are quickly digested and absorbed. Cinnamon Swirl This is a Buy 1 Get 1 FREE offer! Lucky Marshmallow This is a Buy 1 Get 1 FREE offer!